A printed thangka of Buddha Akshobhya, who is one of the Five Dhyani Buddhas. Known as The Unshakeable Buddha, he bestows clear mirror-like wisdom, which can transmute any anger, and is very powerful for clearing general negative karmas. 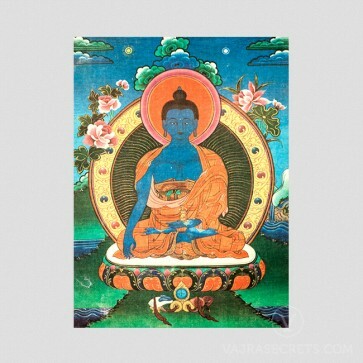 A printed thangka of Buddha Akshobhya, one of the Five Dhyani Buddhas. Also known as The Unshakeable Buddha, Akshobhya is the head of the Vajra family which is connected with reason and intellect, and his Eastern Pure Land is called Abhirati. His body is blue in colour, symbolising clear water that reflects things as they are, and he is the embodiment of mirror-like wisdom and knowledge, which can transmute any anger. Just like Buddha Shakyamuni, his right hand is in the bhumisparsa or earth-touching mudra, signifying his unshakeable strength and the truth of his commitment to liberation. His left hand holds a vajra, symbolic of enlightenment. Akshobhya represents the absolute Buddha Mind and he bestows Non-Dual Wisdom as the perfect antidote for anger. His mantra is very powerful for clearing general negative karmas.